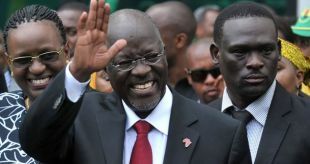 The Alliance For Democratic Change (ADC) has asked the Tanzanian government to withdrew its moratorium on political parties bid to hold rallies. The government placed a ban on the activities of opposition parties, preventing them from holding rallies in a bid to prevent violence. ADC Secretary General Doyo Hassan Doyo told journalists in Dar es Salaam on Sunday that the oppositions bid is to hold rallies with its members and prepare for next elections. In view of this, he said the ban was denying political parties in the country the right to declare their policies and future plans to Tanzanians. "The political situation in the country isn't encouraging, the government's ban on holding political rallies has affected our activities, therefore we sincerely request President John Magufuli to lift the ban" he said. He also called for members of the Civic United Front (CUF) who are led by Mr. Maalim Seif and members of the other side who are led by Prof Ibrahim Lipumba to sit down and clear their political differences. "As an opposition political party in the country, we condemn the ongoing situation between the two CUF sides, as it weakens our stability as political parties in challenging the ruling party" he said.